Bill's OBX Beach Life: Hurricane Bill Wave Report, OBX - Day Two - SCORED!! 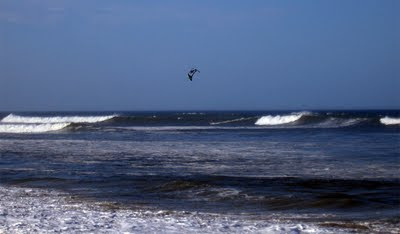 Hurricane Bill Wave Report, OBX - Day Two - SCORED!! Damn it was awesome today!!! Coqunia Beach just north of Oregon Inlet was the call. I am leaving for Punta San Carlos, a week from today...what a primer for the upcoming trip!! Full report coming soon including photos!! Sick dude, glad you guys caught it up there!! Nice! Looking forward to more pics/reports from the rest of the weekend. I can't wait to see how big the water gets. When we come out there in late Sept, you've got to take us to that spot if the setup is right. You've posted about it a few times now and the waves look just like Punta San Carlos....I want more of those waves. I'm jealous you're going to PSC next week and looking forward to reports from down south as well. I cannot wait for the experience again, especially in perfect waves as was found at Coqunia on Friday. Hey, its tropical season on the OBX so hopefully, there will be more days similar to Friday in 2009?! Damn though if that IWS forecast for tomorrow pans out, we may definitely see round Two?! Hurricane Bill and the OBX...From This to THIS? !